The Thetford Cassette Toilet: the perfect mobile toilet solution! For ease of use, the Thetford Cassette Toilet surpasses any comparable toilet. 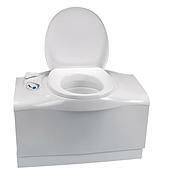 The Thetford Cassette Toilet's unique design ensures it fits with every modern caravan and motorhome interior. 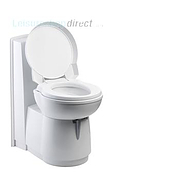 The Thetford Cassette Toilet is manufactured from high quality materials, has a powerful flushing system, and has advanced fixtures and fittings. 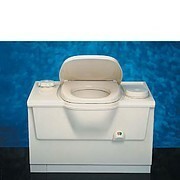 What’s more, the toilet will form an integral part of the bathroom of any caravan or motorhome. 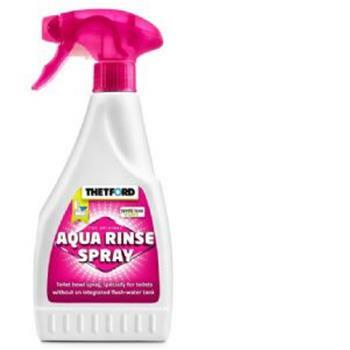 Combined with Thetford toilet additives, Thetford Toilets offer the ultimate sanitary solution for your caravan or camper! What is so unique about the Thetford Cassette Toilet? What makes the Thetford Cassette Toilet unique is external access. A small door on the outside of your vehicle gives you access to the detachable waste holding tank, making it much easier to prepare the tank for use from outside. It also makes it easier to empty and top up the waste holding tank hygienically, and you won’t spill a drop! How do Thetford Toilets work? 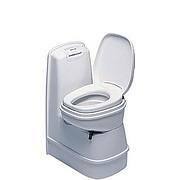 The toilet consists of two parts: a permanently installed toilet and a waste holding tank that you can access and easily detach from outside. 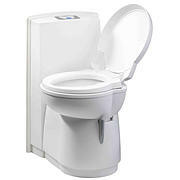 To prepare the toilet for use, you simply add toilet fluid to the waste holding tank. For models with an in-built flush-water tank, you also need to fill this tank. The toilet is then ready for use. A level indicator shows when you have to empty the waste holding tank. Then all you have to do is detach the tank and empty it in the nearest authorised waste dump. After that, you make the toilet ready for use again. There is a wide choice of cassette toilets. 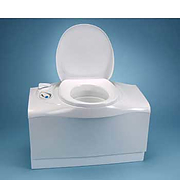 Thetford Toilet Cassette type C2 C3 and C4 - Spare PartsThe C2, C3 and C4 Cassette models have a fixed toilet bowl and therefore blend in harmoniously with your bathroom interior.The new Thetford C-250 Cassette Toilet is the ultimate sanitary solution for your caravan or camper. 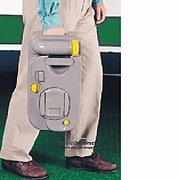 The The C-400 Cassette Toilethas several unique features, including the fact that the waste holding tank has wheels and a retractable handle to allow ease of handling. In addition, the working mechanism in the waste holding tank is removable, making the inside of the tank easy to clean and maintain, while an advanced level indicator display shows the levels in the waste holding tank and/or flush-water tank. 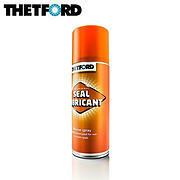 Search our extensive listings of Thetford Toilet spares to repair or upgrade your current Thetford Toilet, using the exploded diagrams we provide free of chrge to help you understand how and where to fit each one of the Thetford spares you need. Thetford Service Doors are here in various sizes and colours plus schematic diagrams to help identify the spare part you require. 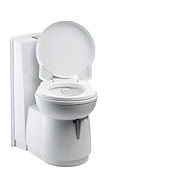 The built-in Thetford C402X Cassette Toilet consists of two parts: a permanently installed toilet and a removable wasteholding tank. 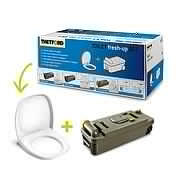 Thetfords fresh-up Set is all you need for a fresh toilet, just in one box! Spare parts for the Thetford Cassette toilet types C2 C3 and C4. Please click through to the next page to view schematic diagrams. Thetford C2 C3 + C4 Cassette Holding Tanks and Spare Parts Please click through to the next page to view schematic diagrams. The brand new C-250, with its contemporary design, has several exciting new and improved features. Please click through to the next page to view schematic diagrams. 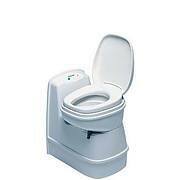 The Thetford C-200 is a permanent, swivel bowl toilet for caravans and motor homes. Please click through to the next page to view schematic diagrams. C-402C Bench model for Caravans and Motorhomes plus spare parts. Please click through to the next page to view schematic diagrams. 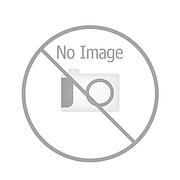 Thetford C-403L Bench model for Caravans and Motorhomes plus spare parts. Please click through to the next page to view schematic diagrams. 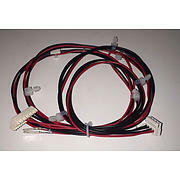 Thetford C-400 Series Holding tank for use with the Thetford C-402C / C-402X and Thetford C-403L plus all spare parts available. Please click through to the next page to view schematic diagrams. With Thetford Service Doors, you can create extra and easy access to certain areas in your caravan or motor home. 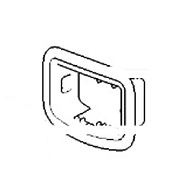 Please click through to the next page to view schematic diagrams. 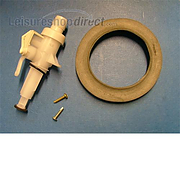 Water valve kit for Aqua Magic IV model toilets. 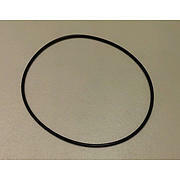 Comes with new closet flange seal. 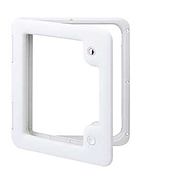 Thetford C250 Wallbox - special order takes 3-4 weeks. Thetford SC260/CWE eletric blade includes- Motor eletric blade + metal braket eletric blade + gear wheel motor. suits c260 models. 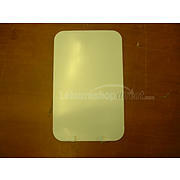 Thetford Cassette Toilets for caravans and motorhomes. A full list of Thetford Spares are below. 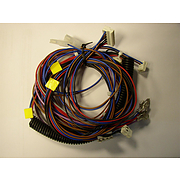 Includes the C-200CW, C-402C and C2, C3 and C4 cassette spare parts.